There are many ways you can cultivate a connection to farming and gardening within your family. Helping children to understand where their food comes from helps to shape them into more well-rounded and informed eaters as they grow. With the advent of local farmers’ markets and more awareness around sourcing, eating locally grown food has certainly become easier. And this is greatly to our benefit: food picked and shipped a long way can lose much of its nutritional value as it’s picked well before ripeness. Schools have also begun embracing gardening and farming programming, and the results encourage us to get our kids into gardening so they eat produce that is as fresh as possible–grown locally and often right in our own backyards. Encouraging connection with the source of our food, either by visiting and patronizing local farms or growing our own, can even help educate children on ingredients. Studies have shown that children who participate in school garden programs deepen their knowledge of healthy foods and connection to the earth. Join a local CSA: Community-supported agriculture provides you with a share of fruits and vegetables that you can pick up on a regular basis in exchange for your buy-in at the start of a season. This is a great way to explore new foods as you often have little control over what you get–it’s whatever is growing in-season! Garden with your community: If you live in a major city, you can often find a nearby community garden that will allow you to get a small plot of land to grow your own food. You might also get your school community involved by starting a gardening program there. Create your own vegetable garden: If you’ve got a plot of land, or even a patio or deck, starting a garden is easier than ever. Even just growing a few favorite fruits, veggies or herbs can give children a sense of accomplishment and encourage them to eat ingredients that they’ve fostered from seed to fork! To make life a bit easier, check the online USDA Plan Hardiness Zone map ( www.planthardiness.ars.usda.gov) to find your zone and plan accordingly! Starting a garden with your kids is extremely rewarding, and it doesn’t need to be overwhelming. Gardening is increasing in popularity, and so are the great products that go along with it. You can certainly have a successful garden with simple planting boxes, soil, seeds and basic care tools like fertilizer, shovels and watering cans. 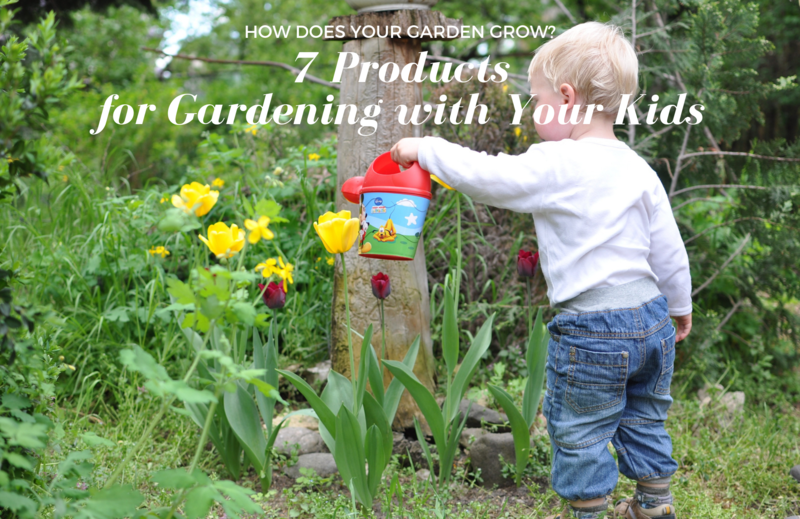 But if you’d like to check out some products that make gardening with kids even easier, more successful and (of course) fun, here are a few of our ideas! This amazing contraption is container gardening at is best. This product is self watering, sustainable and can be used to grow indoors or outside. These reasonably priced systems (they even have a Junior version) provide everything you need to grow fruits, veggies or flowers. Getting right-sized gardening tools is key to an enjoyable time out in the yard, and these adjustable tools don’t disappoint. A shovel, hoe, leaf rake and soil rake, along with a wheelbarrow, will let kids jump right into the process from seeding to weeding to harvesting. Give kids their own little plot of land with this 2-foot high trough to plant their choice of seeds. It’s the perfect height for little ones, small enough that it won’t overwhelm, and, raised off the ground, less susceptible to pests and weeds. This is a super easy way to introduce little ones to gardening in a simple and exciting way. You can choose from a veggie or a flower garden and each kit includes the egg carton, seeds, soil, instructions, stakes to identify the plants and a journal to track the garden’s progress. This smaller-sized crop collector is designed for harvesting your garden crops. It provides a way to collect and wash the fruits and veggies right on site (without tracking dirt into the sink) and is designed to be gentler on produce. This great starter kit includes activities for both in and outside the garden. Get your hands dirty (or not) with kid-sized gardening gloves, watering can and seedling planters. Generate excitement for the garden with crafts including coloring masks, garden stickers and a small DIY photo frame. Talk about a cool way to grow your garden! This product allows you to plant seeds that will, over time, grow into a leafy fort. The kit comes with sweet pea and Blue Lake Bean seeds for an edible shelter!